Walking into the school cafeteria you are quickly whisked back to your childhood days of school lunch. For a lot of adults, the memories that arise are unpleasant ones of food no one was very excited about eating. The good news is that school lunch is changing! School kitchens are moving away from the old “heat and serve” model. So let go of what school lunch used to be and look at what it’s becoming! Bellingham Public Schools is in the process of building a central kitchen which will enable the Food Service team to move toward a scratch cooking model. 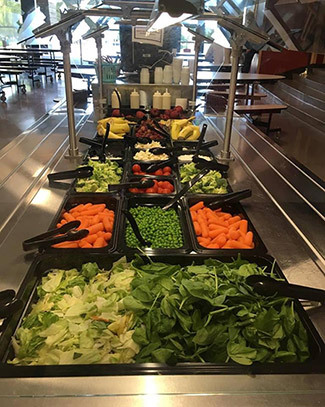 The first step toward healthier meal options was the installation of salad bars in all Bellingham schools. In the Nooksack Valley School District, there are new fully-equipped kitchens at the middle and high schools. The Food Service staff are making the most of these facilities, turning out lunch menus that feature more freshly cooked and made-to-order items. See for yourself! Check out school lunch and eat with your student. Research shows that cafeteria environments are more positive and calm when there are adults eating in the cafeteria. It’s even better when those adults are eating the school meal alongside the students. So whenever you have a chance, join your student and try the school lunch. Chances are you will find it’s tasty, fresh and healthy, a great deal, and a whole lot better than you remember.